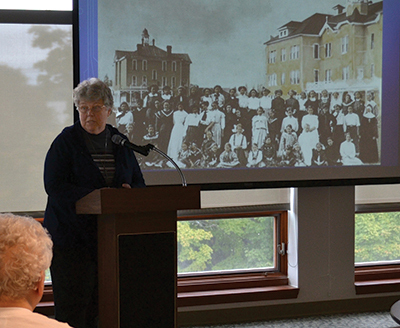 During a recent visit to Dayton for PBLC meetings, Sister Charlene presented an overview of SSMO history and current activities. The Sisters of St. Mary of Oregon mark 1886 as the year of their founding, and education has been a hallmark of their ministry. Sister Charlene has served as superior general since 2010. Last year, she received the Christus Magister Medal — the university’s highest honor — from the University of Portland. Sister Charlene gives a presentation; Michelle Bodine photo.